Since 1984, Board-certified plastic surgeon Dr. Paul Zwiebel has provided a comprehensive range of exceptional plastic surgery services to men and women in the Denver area. At his private practice, Zwiebel Center for Plastic Surgery and Skin Care, Dr. Zwiebel promises to listen closely to you and spend ample time discussing and understanding your cosmetic surgery goals and concerns. Dr. Zwiebel has extensive experience in many cosmetic surgery procedures including breast augmentation, and he is dedicated to achieving beautiful outcomes for his patients. Whether you are wondering how much Denver breast implants cost or you wish to explore your different implant options, your questions will not go unanswered at the office of Dr. Zwiebel. He is one of an exclusive group of doctors that offers his patients the new IDEAL IMPLANT® Structured Breast Implants. What Makes IDEAL IMPLANT Different? The IDEAL IMPLANT is a structured saline implant designed to give women a beautiful, natural look and peace of mind. Since up to 60% of the human body is made up of water, choosing an implant that is filled with saline (a sterile mixture of salt and water) just makes sense. While regular, older saline implants were often thought of as “water balloons” because they don’t keep their shape very well, the IDEAL IMPLANT’s design incorporates a series of implant shells nested together, which controls the movement of the saline, and allows it to flow back and forth in a smooth, natural way. Silicone gel is sticky and can come into contact with surrounding body tissue if an implant rupture occurs, leading to other complications like capsular contracture. You won’t see or even feel an obvious difference in your implants with silicone gel because the rupture is ‘silent.’ A rupture can go undetected for years until other symptoms begin appearing. With the IDEAL IMPLANT, there are zero risks of silent rupture. A woman can always know her implants are intact just by looking in the mirror. No expensive MRIs are needed. The IDEAL IMPLANT deflates slightly, due to its dual-chamber design, and a woman can get the implant replaced at her convenience. Having breast augmentation surgery in and of itself is a big decision. Patients have to prepare themselves mentally and physically for the surgery and then spend time recovering afterward. No patient wants to find themselves back in a surgery center just a few years later, undergoing an involved implant revision procedure. When you’re considering Denver breast implants, costs of subsequent surgeries should be factored into your decision. Dr. Zwiebel says that an operation to replace a silicone gel implant may be “a little bit more involved and a little bit more lengthy” when compared to replacing saline implants. Sometimes surgeons have to perform a complete capsulectomy to remove all the silicone gel that has leaked. Unlike silicone gel implants, the IDEAL IMPLANT can be replaced in a quick and straightforward procedure. It’s common for some plastic surgeons to recommend that women replace their silicone gel implants every 10-15 years, as the risks for complications such as ruptures and capsular contractures can increase with time. 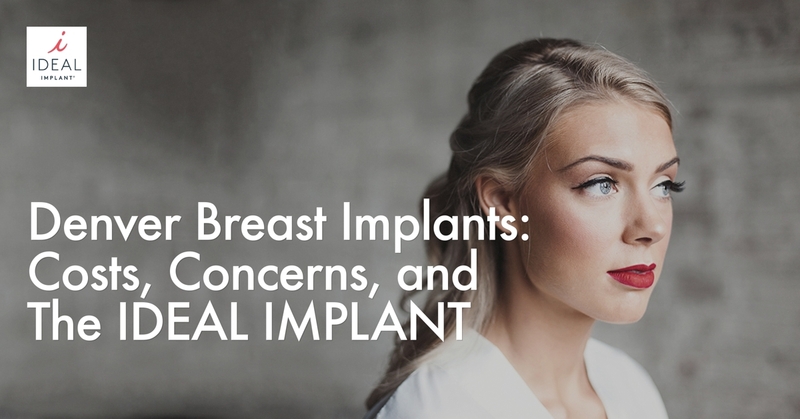 But with the IDEAL IMPLANT, most surgeons say that women can keep the implant in as long as they want, due to its lower rate of both rupture and capsular contracture when compared to silicone gel implants. The rupture risk of silicone gel implants at 8 years, for primary augmentations, can fall anywhere between 7-13%, but the IDEAL IMPLANT rupture risk is much lower at 2.1%. When the breast tissue around the implant becomes hard, swollen, and painful, it’s known as capsular contracture. The capsular contracture risk at 8 years, for primary augmentations, with IDEAL IMPLANT is only 6.6%, as opposed to silicone gel capsular contracture rates, which can vary from 11-16%. In these photos, you’ll see before and after pictures of a 44-year- old woman who choose IDEAL IMPLANT for her breast augmentation. The “after” pictures were taken 6 months after her procedure. This woman is 5’5” tall and 164 lbs. Her implants were filled to 335cc. At your breast augmentation consultation with Dr. Zwiebel, you can discuss how much Denver breast implants cost, the IDEAL IMPLANT, and all your worries or expectations for your procedure. Dr. Zwiebel is dedicated to providing exceptional and beautiful outcomes for his patients in the safest and most comfortable environment possible. From your first consultation through your follow-up exam, you can feel confident in the care you’ll receive from Dr. Zwiebel and his staff. His patients love the IDEAL IMPLANT. Considering how much breast implants cost in Denver, Colorado? Contact Dr. Zwiebel today to discuss your options. Simply call 303-470-3400 or visit www.drzwiebel.com. Dr. Zwiebel’s office is located at 2050 E. County Line Road, Highlands Ranch, CO 80126. Call today for more information about IDEAL IMPLANT.